Lots of plants look similar when they are young. Being able to tell them apart is crucial if you intend to forage for wild foods. I want to take a look at foxgloves, primroses, burdock and dock. The later 3 are all edible*, whilst foxgloves are highly toxic and can be deadly. At this time of year, all 4 of these plants can look similar. 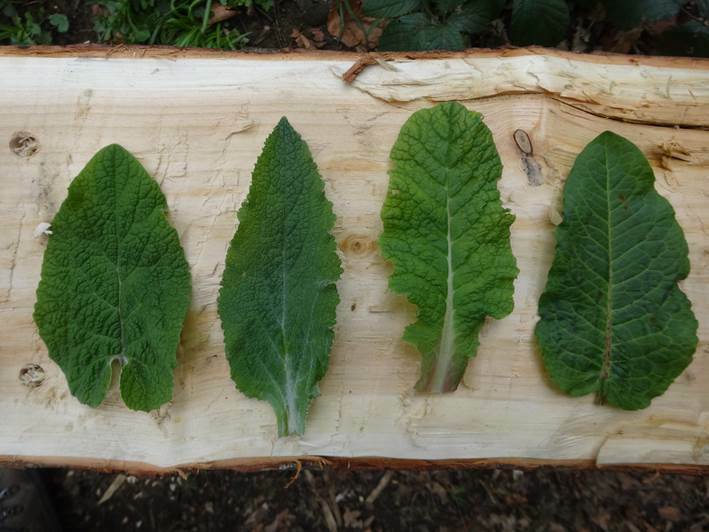 These photos were taken at the weekend and from left to right are: burdock, foxglove, primrose and dock. Most people can recognise a dock leaf from childhood when they used it to rub on a nettle sting and burdock leaves tend to be relatively wide and are hairy. All of the leaves above are a slightly different colour and texture. For me the dock leaf is glossy, primrose a little less so whilst burdock and foxglove have a matt finish. The foxglove leaf is also a little more pointed. Where the differences are really apparent is on the back of the leaves. 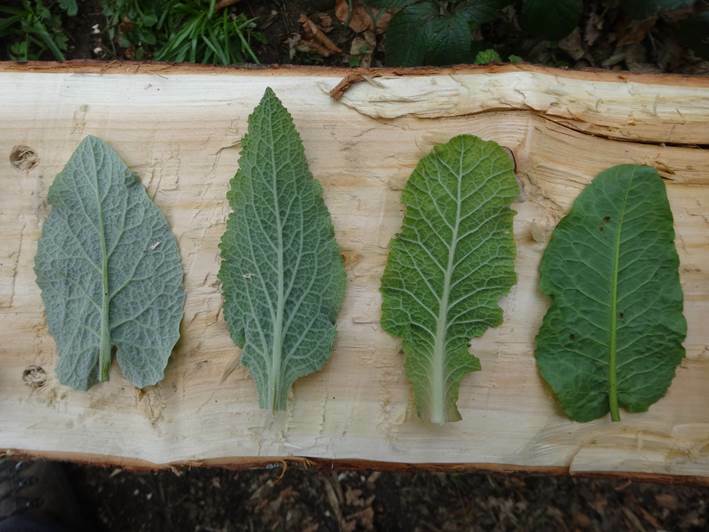 They are in the same order as previously, so burdock, foxglove, primrose and dock. Now the colour differences jump out. But the easiest way to tell them apart is to look at the veins on the leaves. Whilst the veins on the burdock, primrose and dock go to the edge of the leaf, the veins on the foxglove turn upwards and run almost parallel with the main stem. Make sure that you doublecheck in your plant identification book and if you aren’t confident with identifying your plants, don’t take the chance, don’t eat them! *Edible doesn’t mean tasty! Burdock leaves have a very bitter taste that tends to linger; the stems are ok and we’ve eaten them steamed and served with a cheese sauce. Dock leaves are better known for their medicinal uses and need to be boiled twice before they are edible. I’m not that keen on primrose leaves either, but I don’t mind the flowers in an infusion or salad. Good luck with the edible flower garden; we have a herb garden at home and it does really well. As for bugs, just plant a few extras for them! Hi, I live in an area very close to a park which has a small area of woodland at the top of the hill. 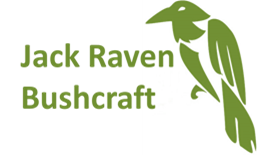 I have recently started making my own cosmetics and would like to use more natural products. I’m on the look out for burdock root and was wondering how I could identify the leaf and where I’d most likely find it. Hopefully the photos above will help with identifying burdock. It tends to grow on field edges and along woodland rides. Please be aware that commercial foraging is illegal without the land owners permission. It is also illegal to dig up a plant for its roots unless you have the landowners permission. The root is at it’s best between the end of its first year and the start of its second year, from October to March (ish). Yes, the roots are different. It is illegal to dig up a plant for it’s roots without the land owners permission. Plus some species are protected as well. The issue with digging up a plant for the roots is that you kill the plant; whilst we dig up plants to eat the roots from time to time (burdock is the only one with edible roots in this post, although technically it’s a tuber) we do so in a sustainable way ensuring that we only take a small proportion of the plants around, generally about 10% in any one area. You need to have made a positive identification of the plant prior to digging it up, assuming it isn’t a protected species, you have the land owners permission and you are following the 10% rule, or else you’re killing a plant for no real purpose. Could anybody make a dandelion and burdock wine?